Research shows that one of the most effective ways to create behavioral change is positive social pressure. Fun, social neighborhood events that spotlight positive examples of our peers making changes in their homes and lives that help to create a more sustainable world have many benefits. We are organizing Fossil Free Your Life Neighborhood Events, in collaboration with the City of Boulder, to build stronger neighborhood cohesion, create a safer, healthier, more socially thriving and economically vital community, and to help meet our City’s climate and resilience goals. These events promote the multitude of green businesses and nonprofits doing great work in our community, bring neighbors together, and provide a fun opportunity for busy people to learn about the plethora of opportunities to reduce fossil fuel costs and emissions. We are coordinating with the City of Boulder, area businesses, nonprofits and neighborhood groups to organize at least four of these events in 2016. We will identify showcase homes or neighborhoods in four areas of our city and work with the homeowners, local businesses and nonprofits, neighborhood groups and our broad network of over 2,000 local members, to plan, organize, publicize and conduct events that spotlight solutions and empower people to reduce their greenhouse gas emissions through energy, transportation, waste management, and lifestyle choices. The forth event took place in a community near Chautauqua. Neighbors got to speak with vendors and volunteers to get inspired about decreasing Carbon Footprints to leave a better world for the next generations. There was no shortage of yummy finger foods for everyone to enjoy; there was face painting for kids; and of course, there was a chance to meet and mingle with people in the neighborhood! BYO Dishware! – In celebration of our zero-waste goal, we did not use any single-use dishware! Most offerings were finger food, however, people BYO’d their own dishware or tuperware to enjoy the offerings! Bike or Walk! – Many people walked and biked to the event! Three of our vendors even loaded their table and whole set-up on their bicycle trailers! It can be done! Giving Table – The Giving Table was a huge success! Many items came and went. There were lots of good finds and people happy to walk away with gifts they had no idea they would get! This is a great way to repurpose, reuse and avoid extracting more precious resources from our Earth! Brian Fuentes (architect at Fuentes Designs) spoke about the Net Zero aspects of the featured (almost) Net-Zero Home! Face Painting and Playing Station for kids! Inspiring Booths for positive change! Boulder Food Rescue! B.Y.O. Dishware! (for Zero Waste!) Decreasing the Food Footprint! 350 CO – Keep it in the ground! Community Building with a FFYL theme! We’re looking forward to working with nonprofits, businesses, neighborhood groups and individuals who can connect our community with ways to fossil free their lives. Keep your eyes peeled for our future events, and contact us if you would like to get involved! If you are interested in hosting an event, please contact info@350colorado.org. These events have been made possible through a Neighborhood Partnership Grant which has been awarded to 350 Colorado by the City of Boulder, and through contributions from various sponsors. If your business or nonprofit is interested in participating in or sponsoring an event, please sign up here. Sponsorships are much appreciated and will help us cover costs for coordinating, permitting, materials, and outreach. Thank you Fuel Switch (Snugg Homes), Sun Run, Fuentes Designs, Eco-Cycle, Nomadic, Bee Safe Boulder, Boulder Food Rescue, Habitat for Humanity, Mission Wolf, BoCHA, Momentum, Boulder (and Beyond !) Vegan Meetup Group, Jim Morris Environmental T-Shirts, and Rainbow Lightning for participating in our forth Fossil Free Your Life Event! And thank you to So Delicious and Tofurky for your generous donations! Thank you National Hemp Association and Nomadic, Inc. for sponsoring our second Fossil Free Your Life event! The third event was in partnership with Newlands Greenlands concert and picnic in North Boulder Park on September 11, 2016. The main emphases of the 350 Colorado booth and tables were to inspire event-goers to make commitments to reduce their personal Carbon Footprint and raise awareness about TPP, fracking and divestment from fossil fuels. Visual and written materials covered aspects of how to combat climate change in the following areas: food, transportation, consumerism, home energy use, business practices, customer incentives, standing up against fracking initiatives and socially responsible investing. Event-goers were encouraged to read and reflect on the displayed materials. Points were awarded for engaging with us in a variety of ways: leaving comments, making commitments to make changes in their lives that would lower their Carbon Footprints, and even eating the plant-based foods our booth offered to encourage a diet that results in cutting Greenhouse Gas emissions! A list of 17 “Eco-Pledges” allowed people to consider which actions they are willing to take in their lives to make a difference. In total, 117 Eco-Pledges were made at the event, and the following comments are among those written in the Comment Book. We held our second event on Sunday, June 12, at Nomad Cohousing – a huge thank you to our wonderful hosts! This time around we enjoyed a zero-waste community meal (thanks for some awesome donors) including solar-baked cookies, held a prize drawing of some Green Guru and Evo Hemp gear, pedal-powred our sound system, and provided some great, sustainable kids activities. We welcomed back many of our vendors and were grateful to see some new face in the mix. Pedal-powered sound system thanks to EnergiSimple! A huge thank you to our team of hosts and volunteers! Donated gear from Green Guru. We kicked off our event series during Boulder Earth Week with a block party on April 23 hosted by David Adamson of SnuggHomes – thank you to all of our amazing vendors, volunteers and community members who helped to make our first event a success! Bee Safe Earth spreading the buzz about how we can protect pollinators! Denise of Magic Brush Arts adding finishing touches to our new mural. Banshee Tree performing from David’s upper deck. Guests were able to test ride electric bikes and they were a hit! Many of our local leaders and members are taking action to drastically cut their greenhouse gas emissions and to transition to a fossil free future. We share these stories to inspire others to take action and share their ideas! Have a solution story to share? 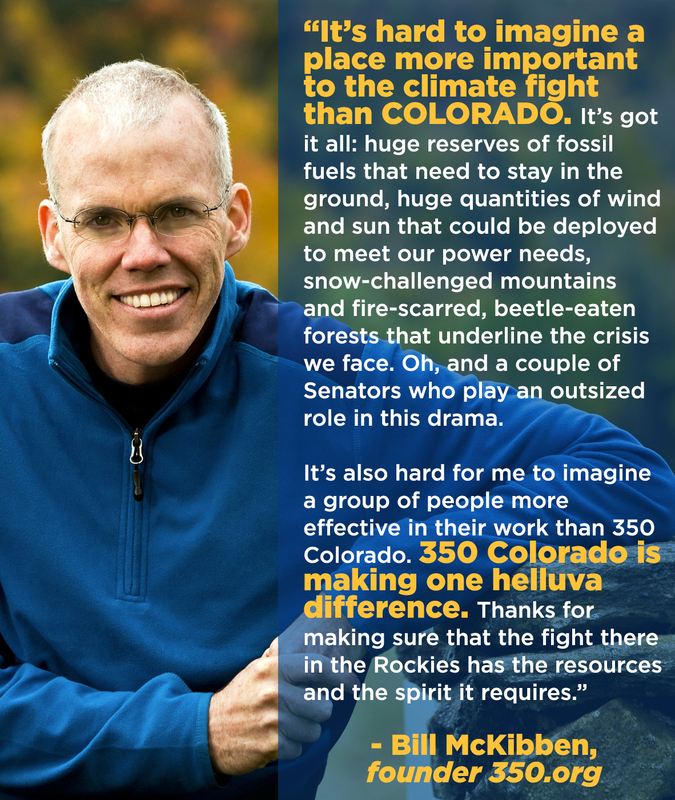 Please email micah@350colorado.org.